The Mayflower has an iconic place in American history as a symbol of European colonization. The ship transported English separatists, also known as Puritans, from Plymouth England to Plymouth Massachusetts in 1620. They undertook the grueling 66-day journey to escape religious persecution. The actual dimensions of the ship are unknown, but estimated to be 90-110 feet in length and 25 feet in width. The Mayflower carried 102 passengers, of which half were puritans the the remainder were hired hands, servants, or farmers. Originally, the ship was intended to reach the mouth of the Hudson River, but after blowing off course anchored in Cape Cod Bay. The passengers remained on the ship through the winter and moved ashore at Plymouth in the spring of 1621. It is believed that in November of that year, the Mayflower survivors held a harvest festival to give thanks for their salvation, beginning the annual tradition of Thanksgiving in the United States. The reverse of the coin features a depiction of the Mayflower in full sail. A colored globe map appears in the background. 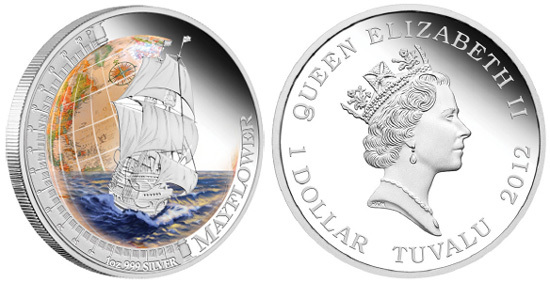 The inscriptions include “Mayflower” and the weight and precious metals content “1 oz 999 Silver”. On the obverse is the Raphael Maklouf effigy of Queen Elizabeth II. A maximum mintage of 5,000 pieces has been established for this release. Previous issues of the series feature the Santa Maria and Golden Hind. Upcoming issues will feature the Constitution and Cutty Sark. For placing orders or additional information visit the Perth Mint product page. I believe I have one of the original 1620 coins. I would like to know how to find out if it is and how much it is worth. I would grade this coin at fair condition.